Unauthorized Withdrawal: "Thank God this doesn't happen every Friday!" It was a warm and sunny afternoon in Galesburg as the business week was coming to an end last Friday. Perhaps this is why at least two employees of Galesburg's downtown Norwest Bank were suspicious when a middle-aged man entered the bank wearing a gray hooded sweatshirt (with the hood up), sunglasses and gloves. This odd "patron" added to his conspicuousness by tightening the hood over his head as he came into the bank. This guy must have looked something akin to the penciled police sketches circulated during the hunt for the Unibomber. A male Norwest officer saw the man enter from his corner office and he walked over to another employee sitting at her desk in the bank's lobby and said quietly, "Is he doing what I think he's doing?" as the suspicious man walked up to the first teller window. As he looked down at his colleague it became clear that she too had noticed and was already writing down a description of the curiously clad "customer." Meanwhile the man in the sweatshirt had reached the teller's window where he took a brown paper bag out of his right sweatshirt pocket and handed it to the teller. The mystery man made his intentions clear as he instructed the teller, "This is a robbery, fill the bag." The bank robber's left hand remained out of sight in his left sweatshirt pocket throughout this interaction giving bank employees the clear impression that he had a handgun there. Although the teller was clearly working feverishly to empty both of her money drawers into the bag the robber was growing impatient and urged her on, "Hurry up!" As the teller handed back the now-filled paper bag the robber shoved it in his pocket and warned the teller, "If you look out the door my buddy will shoot your head off!" He then walked quickly out the bank's Main St. entrance and headed eastward on the sidewalk. The bank officer who first noticed the suspicious character enter the bank followed the robber out the door and down the street. Meanwhile the teller quietly put up her "Teller Closed" sign as another bank employee hit the silent alarm. The robber began shedding his sweatshirt, gloves and sunglasses as he walked toward his teal Ford Aerostar minivan with unique specialty license plates proclaiming him to be a Bronze Star military hero. The bank officer had managed to stay with him the whole way and wrote down the license number as he pulled away from the curb. The lone bank robber headed east on Main St.
Galesburg Police received a 9-1-1 call from Norwest at 4:01pm, this was a mere two minutes after the robber first entered the bank lobby. A minute later, the first officers began arriving and the bank was closed for the day. As officers began questioning witnesses within the bank a radio description of the suspect and his vehicle was broadcast along with notification that another Galesburg bank had just been robbed. It was now 4:04pm. Almost immediately Galesburg Police Officer Mike Carroll recognized a vehicle matching the radio alert near the corner of E. Main and Farnham streets. The van turned north on Farnham and the officer hit his lights and pulled the van over at 4:06pm. Carroll parked his patrol car in front of the van as another GPD car pulled up behind. Both officers got out of their cars, weapons drawn, and began to approach the suspect van. At this point the van's driver suddenly put this vehicle in gear and pulled away from the curb in a hurry. As the startled officers scurried back to their squad cars, the minivan headed north on Farnham until it reaches Lincoln St., also known as County Highway 40, "Old 34." The officers had already radioed into the public Safety Building and other officers were enroute before the robbery suspect bolted. These other police cars are all converged on the corner of Farnham and Lincoln streets as the minivan turns right, heading northeast and out of town. Some officers speculated the driver had seen them approaching on Lincoln St. and turned away from the oncoming squads. Another rationale could be simpler; the owner and driver of the fleeing minivan, Donald Breuer, lives in Wataga and this is the way home. Breuer drove fast toward Wataga on the highway as he was pursued by a growing parade of various police cars-- lights and sirens blazing. By 4:10pm, in what some officers suspect was intended to be an attempt to elude the pursuers on the gravel back roads of rural Knox County, Breuer eventually made a right turn onto a gravel road identified as 1925N. This was a poor choice; the road rapidly revealed itself to be a dead end. At the end of this road Breuer took off into an adjacent pasture in an attempt to turn around and double back toward County Highway 40. His pursuers had other plans. At least five or six police vehicles were involved by this point and two followed Breuer directly into the pasture. Another two or three turned north off the road into the pasture intending to hem Breuer's vehicle in while other squads attempted to block the lane heading back to the County Highway. It is at this point that the story gets interesting, confusing and tragic all at one time. According to Galesburg Police Chief John Schlaf, both Knox County Sheriff's Deputies and GPD officers were involved in the violent altercation that took place. The police wanted to box in Breuer and had essentially surrounded his vehicle in the pasture south of Wataga. With officers stationed on at least three sides of his minivan, Breuer apparently stopped in the field as the police exited their cars and approached-- guns drawn. Due to the ongoing investigation, the details of exactly what happened next are sketchy and we may never know for sure exactly transpired. But there is no question that a hail of gunfire was directed at Breuer's minivan and two Galesburg officers were shot. What we do know is that subsequent investigation has so far uncovered no weapon possessed by Breuer and Schlaf acknowledged that no officer interviewed so far has said that Breuer was witnessed firing at officers. Despite his posturing at the bank, it now appears that the suspect was not armed. Officers approached the minivan from at least three sides and Sergeant Thomas Camper apparently got all the way up to Breuer's driver side door where he reportedly stuck his arm holding his service weapon through the window. At some point some officer present, so far unidentified, thought he heard a gun shot and began firing at the minivan. This may have occurred before or after Breuer put the vehicle in gear and tried to drive off. Officers surrounding the minivan began firing and, according to Schlaf, many officers fired many rounds in a very short period of time. Again, no officer has reported seeing Breuer firing at police. This was the one and only time during the incident that shots were fired, Schlaf explained. While the investigation and "Administrative Review" is still ongoing, Schlaf is reluctant to reveal too many details of what happened. It seems pretty clear that even he isn't totally confident about what exactly occurred and in what sequence. He did say that Breuer behaved suspiciously within the minivan and, based on Breuer's behavior and statements at the bank, the police officers present had no choice but to assume Breuer was armed. Schlaf commented Tuesday, "A number of police officers discharged their weapons and a so-far undetermined number of shots were fired upon the suspect's minivan. The justification for the officers' actions seems well within department and professional guidelines as well as Illinois statutes. We in the department fully support the actions of the officers involved as does Knox County State's Attorney Paul Mangieri." During the incident Breuer also drove directly toward officers on foot and struck GPD officer Joe Luna, knocking him to the ground but not injuring him seriously. Early on in the pasture altercation Breuer also rammed head-on one of the squad cars surrounding him. Clearly all of the officers involved had to act on instinct and training while in the midst of a fierce adrenaline rush with little or no time to carefully consider everything that was happening. The Administrative Review is only beginning but at this point the assumption is that all of the gunshot wounds were the result of bullets fired from police weapons, so-called "friendly fire." Given the confusion of the moment and the reported locations of the law enforcement officers surrounding the suspect's minivan it seems quite likely that Carroll and Camper were caught in the line of fire of their fellow officers. It is also possible that in the melée Camper's weapon discharged in such a way as to cause at least one of his own wounds. Schlaf reports that Carroll's weapon was not fired. The entire shooting incident took place in less than two minutes. As Breuer amazingly managed to elude officers and head back toward County Highway 40, two Galesburg Police officers lay wounded in the pasture. Carroll had a gunshot wound in his right shoulder and Camper was much more seriously injured, shot in his head just above his right eye and in his shoulder. Both officers were taken by ambulance to OSF St. Mary Medical Center where Carroll was treated and released but Camper was transferred to OSF St. Francis Medical Center in Peoria for surgery and additional treatment. "A primary reason we are doing the Administrative Review is to study the tactics employed in this incident," continued Schlaf. "It is possible that better tactics could have prevented officer injury and/or the suspect's initial escape from that pasture. We spend a good deal of time and effort on officer training and we want to learn from experiences such as this. It is likely that what we learn from this incident will be reflected in future officer training." Even though Breuer escaped that pasture he was hardly unscathed by the volley of lead that had flown all about him. He was struck three times by officer's bullets. Once each in his left shoulder, his left leg and his left wrist. By 4:12pm a now-wounded Breuer was driving back south toward Galesburg. He was bleeding and shook up and this showed in his erratic driving. This former Warren County Deputy Sheriff was also determined to escape and the pursuit was anything but over. One of the first vehicles Breuer passed as he drove southwest on County Highway 40 was a truck driven by local free-lance videographer Chuck McClurg who had heard the police radio call on his scanner and raced to capture what he could on videotape. McClurg captured some truly startling and exciting video of Breuer's approaching minivan and the parade of police in hot pursuit. As the last police car passed him McClurg made a U-turn and joined in at the tail of the pursuit, videotaping all the way. Breuer wisely decided not to reenter the Galesburg city limits and he turned southeast on County Highway 9 heading toward Knoxville. By this time multiple police agencies were involved in the pursuit­­ including the State Police and even the locally-based Illinois State Police Crime Scene Technician. Breuer drove to County Highway 7 (which is the continuation of E. Fremont St. outside of Galesburg) where he turned east. Unbeknownst to Breuer, he had just eluded a carefully set trap staged by Knox County Sheriff's deputies slightly further south on County Highway 9. The deputies had positioned so-called "stop strips" across both lanes of County Highway 9 before it entered East Galesburg hoping to end the pursuit before it reentered town. Breuer continued on County Highway 7 until he reached a north-south gravel road, 800E, where he turned right or south. He drove south until he reached Blaze Rd, another gravel road, and Breuer turned right again this time headed west and back toward County Highway 9. At the County Highway 9 intersection Breuer turned left (south) and headed straight into East Galesburg neatly circumventing the Sheriff's Department trap. It was now 4:19pm; school was out and children were at play. Once in East Galesburg Breuer drove wildly in a confusing pattern through otherwise quiet residential streets. Observers reported that this was by far the most dangerous part of the pursuit (excluding the pasture gunfire) as Breuer allegedly narrowly missed hitting pedestrians and other vehicles. He apparently hoped to elude his pursuers but by this time that was highly unlikely. Eventually Breuer got back on to County Highway 9 heading south toward Knoxville. As he approached the Knoxville I-74 interchange, Breuer decides to get on to the interstate highway heading eastbound toward Peoria. His law enforcement entourage, now growing rapidly impatient of the pursuit, follows him on to I-74. The parade traveled approximately three miles on the interstate until it approached the Lewistown exit and US 150 interchange. Breuer took this exit and turned eastbound on US 150 toward Williamsfield or Peoria. For some reason Breuer again changed his mind and decided to attempt to make a U-turn in the median. As his minivan became temporarily slowed or hungup on the grass, Knox County Sheriff's Investigator Jim Thompson rammed his unmarked car directly into Breuer's van and the pursuit was over. Various police officers promptly stopped their vehicles and rushed toward Breuer's minivan ordering him out. Breuer took enough time to have a final draw on his can of beer before voluntarily getting out of the vehicle. As he opened his driver's-side door and began to step out three or four officers immediately wrestled Breuer to the ground and cuffed him. McClurg, who followed the circuitous pursuit to it conclusion at great personal risk, captured all of this on videotape. At various times throughout the pursuit, Breuer's speed varied considerably from quite fast to amazingly slow. There were also numerous vehicle "altercations" during the pursuit as either Breuer would ram into the side of a police car or a police officer would slam into Breuer's minivan. In all, at least five police vehicles were damaged, three Galesburg squad cars and two Knox County Sheriff's vehicles. 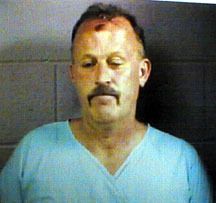 According to Knox County Chief Deputy Gerald McClaren, Thompson's vehicle was damaged the worst. Thompson had apparently just gone off shift when the pursuit began and as the Sheriff's Investigator on call Friday night was taking his unmarked vehicle home before he joined in on County Highway 40. "I was in my office editing a story of the Galesburg Emergency Police when I heard the initial radio reports about Norwest Bank over the scanner," said McClurg Monday. "I immediately ran for my truck and headed off east on Main St. When I heard that the suspect had been spotted at Farnham and Main I turned north on Lincoln anticipating the pursuit to be heading toward US 34. I had my video camera poised on my shoulder as this blue-green minivan came toward me southbound on Old 34. I had no idea that officers had been shot until after the pursuit was over and a State Police officer told me." McClurg is a freelance videographer who frequently does video taping of accident scenes for insurance companies and law enforcement agencies. He also provides Galesburg-area new video coverage to WQAD in the Quad Cities as well as CNN and other media outlets. His videos have frequently been used as evidence in both criminal and civil proceedings so he was no stranger to "live" news events involving crime or motor vehicle accidents. However, "This was the wildest crime drama I have ever personally witnessed or videoed. This was clearly a dangerous situation and the first time I was that close to a criminal suspect police were trying to take into custody." McClurg's astounding video has already been seen on News Channel 8 as well as many ABC affiliates nationwide, but its most important audience may well be in a courtroom. "I have already given copies of all my videotape to Knox County State's Attorney Paul Mangieri who told me after viewing it that it was some of the best evidence he had! Some people may criticize me for participating in the pursuit but I'm a professional with long established ties to local law enforcement agencies. I believe that the most powerful tool in a courtroom today is videotape shot by someone who knows what he's doing." One memorable scene from McClurg's videotape clearly shows a black semi-automatic handgun lying on the floor of Breuer's minivan immediately after his arrest just off the Lewistown I-74 exit. Many viewers assumed that this was Breuer's weapon when it is now confirmed to have been a Galesburg police officer's department-issue Sig-Sauer .45 caliber sidearm. Two possibilities exist to explain the presence of this gun. The least likely is that one of the officers involved in appending Breuer on the scene put his weapon down before or during the slight struggle as Breuer was cuffed and his wounds attended. This seems unlikely because the pistol was simply left there even after Breuer was in custody and taken away by ambulance. Had this been the weapon of an officer present it seems probable that he or she would have retrieved it almost immediately. The more likely explanation is that this was Sgt. Camper's weapon dropped in the midst of the hail of gunfire in that pasture south of Wataga. After the pasture altercation, the wounded Camper was witnessed crawling on the ground searching for his weapon. Since Camper had his arm inside the driver-side window of Breuer's minivan during the gunfire that wounded him, he could have dropped the weapon at Breuer's feet as he fell away from the minivan. We won't actually know the identity of this weapon's owner until after the conclusion of the Administrative Review and investigation but it clearly wasn't Breuer's. Camper remains hospitalized at St. Francis Medical Center in Peoria but he is expected to be released this weekend. Even following such a release, the wounded officer will require additional surgery and much rehabilitation due to the severity of his head wound. Carroll may be able to return to duty sometime next week according to a police department press release late Monday afternoon. The 47-year-old Breuer is being held in the Knox County Jail on a $700,000 bond with a laundry list of felonies pending against him including aggravated battery, aggravated robbery, attempted murder and aggravated flight-- but no weapons charges. Coworkers at Galesburg's Butler Manufacturing say that Breuer took Friday afternoon off "to play golf" and described him as easily agitated and prone toward violence. There have even been allegations that Breuer boasted about robbing a bank to bar patrons earlier Friday afternoon. Breuer won his Bronze Star while serving in Vietnam. His former brother-in-law and former Warren County Sheriff Terry Hart once hired him as a Warren County Deputy Sheriff. It was also Hart who fired Breuer as a "disruptive employee" after he allegedly accused Hart of illegal and inappropriate conduct while Sheriff. Breuer never again worked in law enforcement despite his reported life-long dream to "be a cop." After Friday it is clear that that career goal is out of the question.